At Outskirts Press, Inc., we take great pride in celebrating the work of our successful self-publishing authors, and we do so each week through our Self-Publishing Author Spotlight. This week we highlight self-publishing author Starlett Fisher, who has published three successful titles with Outskirts Press. 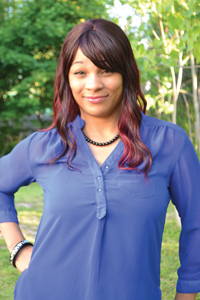 Learn more about Starlett Fisher, her background, inspirations, and published works through this week’s Self-Publishing Author Spotlight. Starlett Fisher began writing at a young age as she escaped the poverty of life and got lost in her poems. She enjoys spending time with her five children and two grandchildren. Her hope is that through her hard work, they will be able to escape many of the issues she was forced to make the best of throughout her life. Starlett takes pride in the fact that she blends poetry and knowledge to bring her stories to her readers. Prosperity is suppose to solve your problems… not become your problem. In A Sparkle in Darkness, a young Sparkle at the brink of womanhood, is forced to face her alcoholism. With a shaky relationship with her sister she finds herself looking for love. While bonds break and cash begins to flow. The strongest link of love is broken. Tragedy around every corner. Seems there is nowhere left to go… except back to the welfare line. Follow Sparkle on her journey and share in her trials and triumphs. Some bonds of love are strong while others are severed easily. The late 1980s was not the ending of an era but the beginning of the age of technology. Olivia Blake a native of Hattiesburg, Mississippi, moved to Buffalo, New York, with her mother to escape the shame of her father’s adultery. She longed for her rightful place in the world, and love. She found that the love she sought after truly was as blind as it was painful. She leans hard on the bonds she has forged with her friends, twin sisters Venus and Pandora Pratt who are plagued by a dysfunctional home life of a different nature. The three girls struggle to escape to a better life as they become adults only to find that once burned by the pains of life you will wear that mark though it is embedded in the deepest darkest places of your soul. Never let fear make you afraid to live! They Call Me Cinnamon introduces readers to Terrence Upshaw who is a fair skinned, good looking, young man in his senior year of college and looking forward to graduation. On the outside, he seems as grounded as any other young person his age, but inside he was being torn apart. Terry had been molested as a young boy by a trusted relative, and was left confused, and longing for a normal life. He kept his abuse secret from his mother who was always working trying to provide for her three children, and usually relied on friends and family for child care. Terry internalized his fears, and the guilt, he placed on his mother as well as himself. When Terry entered his teen years he remained confused about his sexuality, and with no father in his life to show him how to mature into manhood, he took to dressing in women’s attire every now and then in his leisure time. He also began going on internet connected dates dressed in full drag. He had no idea what he was doing. To him it was excitement, and he could be a different person whenever he chose, to him, he was free. Unfortunately, one evening, Terry was walking home after an uneventful and uninteresting date went sour; he was dressed in full drag. He is approached by a group of thugs, at first he thinks it’s nothing but harmless flirting, until a gut feeling signals that he is in real mortal danger. Before he can think of something smart to say, he finds himself running for his life. Terry lies in a hospital bed, raped, and beaten, as his life hangs in the balance. When he comes to, his body is racked with pain, and he is torn both physically and mentally. There, he comes face to face with the coldness of society. Nobody cares if a gay man is raped is all he could tell himself. The police helped to ensure that his suspicions were true. If you’re perceived to be anything but heterosexual then you’re a monster, and a freak of nature. Follow Terry’s journey to find peace and heal. Ready share your adventures and stories? Get published with Outskirts Press! Previous Previous post: Sign Up for Outskirts Press’ First Chapter Plus and Save 10% Today!